There is a violent Islamist extremist group called Tehreek-e-Labaik Pakistan (TLP), which we have highlighted on many occasions. Here are just a few examples of their support for the murderers of innocent people they regard as ‘blasphemers’. (See here and here). We have highlighted many times, the fact that TLP is trying to target British Muslims of Pakistani heritage. Their aim is to gather human resources and donations from the British Pakistani community and which will then be sent back to Pakistan. The issue with this, is that anyone donating to this group, will be donating to a violent Islamist extremist group. Whilst it is registered as a ‘political party’ in Pakistan, its core aim is to ‘defend Islam’ through force, violence and the message that ‘blasphemers’ will be killed. We will be getting in touch with Twitter to shut the following U.K. focussed Twitter account down. Below we list an example of the vile beliefs that they support. Tanveer Ahmed was involved in brutally murdering shopkeeper Asad Shah in Glasgow. The force of the attack was so severe that the Asad Shah suffered numerous cuts and stabbings to his body. The only reason for this was that he had ‘blasphemed’ in the eyes of Ahmed. Sentencing Ahmed in August 2016, Judge Lady Rae said he had committed a “brutal, barbaric and horrific crime”. "Ghazi Ilm uddin is resting in grave but his Dagger is out yet. A Somali Muslim had numerous Islamic State and al Qaida magazines on electronic devices, including articles on how to carry out terrorist attacks using vehicles and knives to create “a trail of carnage”, a court heard. Police seized two laptops, a mobile phone and a USB memory stick after searching the home of Abdirahman Mohamed in Middlesex in July 2017, prosecutors said. Once the equipment was forensically analysed, officers found electronic copies of al Qaida magazine Inspire and Islamic State magazine Rumiyah, as well as other documents including “safety and security guidelines for Lone Wolf Mujahideen”, the court heard. A jury of seven women and five men at the Old Bailey heard on Thursday that Mohamed had also sent a link via a chat room to an 11-minute video created by Islamic State which included images of fighters, burning bodies and executions. The 42-year-old denies 10 counts of possessing a document or record for terrorist purposes all dating between July 2011 and July 2017, and one count of disseminating terrorist publications in March 2016. Prosecutor Kelly Brocklehurst said while Mohamed was not engaged in violence he possessed documents likely to be useful to a person committing or preparing an act of terrorism. Mr Brocklehurst added: “It is not the Crown’s case that the defendant personally engaged in, or was about to engage in, violence to kill or maim people in a political, ideological or religious cause. “Rather the Crown say he knowingly possessed a number of documents that the Crown say are the kind likely to be useful to a person committing or preparing an act of terrorism. Mr Brocklehurst told the jury Mohamed had two electronic copies of al Qaida’s Inspire on a Toshiba laptop, which included articles called “destroying buildings” and “training with the AK 2”. The court also heard Mohamed, of Shadwell Drive, Northolt, London, had copies of Rumiyah on a Samsung Galaxy mobile phone and a USB stick containing a series articles named “just terror tactics”. These focused on vehicle attacks, knife attacks and hostage taking, and talked about causing “as much carnage and terror as possible” and leaving behind a “trail of carnage”. The jury was told Mohamed would exchange messages with people while visiting chat rooms under the name Concerned Muslim. Mr Brocklehurst said Mohamed had used the chat room service to send the link to the Islamic State video in March 2016. He told the court the video showed IS fighters, burning bodies and imagery linked to executions. Mr Brocklehurst said Mohamed also sent messages to people through the chat rooms suggesting he was “sympathetic” to Islamic State. Mr Brocklehurst said Mohamed gave no comment when interviewed by police but provided a prepared written statement which said: “I am a Somali Muslim, my community had been affected by terrorism. The post Terror Accused ‘Had Islamic State and Al-Qaida Magazines’ appeared first on Faith Matters. The alleged gunman who shot and killed five people in a Christmas market attack this month in Strasbourg had pledged allegiance to the Islamic State group, an official says. The judicial official said investigators have found a video stored on a USB stick in which Cherif Chekatt had claimed allegiance to the extremist group. The video was discovered at Chekatt’s home. Chekatt, 29, died in a shootout with police two days after his December 11 attack at Strasbourg’s popular Christmas market. French Interior Minister Christophe Castaner had rejected the claim as “totally opportunistic”. The post Strasbourg Attacker Had Pledged Allegiance to the Islamic State Group appeared first on Faith Matters. Egyptian security forces killed 19 Islamist militants from a cell believed to be responsible for an attack on Christians in Minya province in central Egypt in which seven people died, the interior ministry said on Sunday. Security forces killed the suspects in a firefight after a chase in a mountainous area of the desert west of Minya governorate, the ministry said in a statement. It did not say when the gun battle took place, nor did it mention any casualties among security forces. Islamic State claimed responsibility for Friday’s attack in Minya when gunmen targeted two buses near the Monastery of St. Samuel the Confessor, 260 km (160 miles) south of Cairo. The dead included six members of the same family. Islamic State did not provide any evidence to back up its claim of responsibility, one of several in recent years as Egypt’s Christian minority has been repeatedly targeted. The ministry said the suspects were on the run from security forces when national security intelligence identified their location. “The area was raided and when it was surrounded the terrorist elements opened fire at the forces, which obliged them to deal with the source of the firing,” it said in the statement. Security forces recovered weapons including automatic and semi-automatic rifles, shotguns and ammunition, the ministry said. There had been a lull in major attacks since December, when a gunman attacked a church and a Christian-owned shop near Cairo. Convicted criminal Anjem Choudary who was found guilty of telling British citizens to join ISIS, is to be released this week. He will be living in a tax-payer funded safe house in North London and we have learnt that he will be living within reach of his wife and family, so that his human rights are not infringed. Yet, this very man has never cared about the human rights of others. He has been the poisonous inspiration for young men who have gone on to murder and maim others and his decades of Islamist agitation have caused enormous tensions and further fuelled far right activism, as some people thought that his views represented all Muslims. They clearly did not. Just a few days ago, former EDL member, Ivan Humble made clear on a Newsnight interview about child grooming and the rise of the far right, that he was inspired to join the English Defence League since he believed that Anjem Choudary reflected the views of Muslims in general. Choudary has used the legal and democratic process, to circumvent arrest for years and is now in the process of being released half-way through his sentence. Granted, he is under severe and restrictive conditions but the Government’s inability to stop his release, raises many questions. Why for example, is he being released half-way through his sentence? On what basis is this being done and does the Government realise that his early release is a gift for Islamist and far right groups. Both will use this opportunity, with Islamist extremists suggesting that Choudary has resisted the Government and ‘stood up against them’, whilst far right extremist groups will once again, make out that the Government is not working for the general public’s safety and that the Government is in cahoots with Muslims. This will be their narrative. This whole affair leaves a foul taste in the mouth. How can a man who has been a driver for Islamist extremism be released half-way through his sentence? His actions have been a national security threat, yet he will now live in London, enjoying access to his family and living at the tax-payers expense. If we are to send out a message to extremists that they will be given no quarter to spread their poison, the release of Choudary makes a mockery of this. This whole affair has shown how weak we are when many Muslims themselves, do not want this man released until he serves his whole sentence. 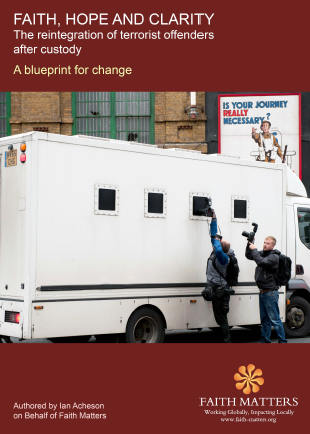 Non-custodial sentences for terrorist related offences is climbing steadily – it’s now 9% of all terrorist sentences – underpinning the need for community based solutions. The post Muslim Communities Can Help Keep Us All Safe By Re-Integrating Convicted Islamist Terrorists appeared first on Faith Matters. We have spent a week in France meeting with key organisations and with people who understand how poisonous the tentacles of Islamist extremism have been and how they have also given rise to greater feelings of anti-Muslim hatred, which have been fuelled by a number of factors. We have spoken to Muslims who see the victim narrative pumped into French Muslims who have suffered anti-Muslim hate incidents and to those who have had their fears expanded because of the perpetual victim narrative that Islamist groups in the country have been promoting. What is happening in France is troubling. It is troubling since the State is grappling with extremism, disaffection within parts of its population, anti-migrant attitudes and a hardening of political stances to groups who talk about discrimination. Yet, there is another issue that is layered on top of this and it includes Islamist groups who talk about Islamophobia as if there is a perpetual battle between Muslims and the State. They take a ‘them and us’ approach which is constantly filtered into discussions and talks at a local level and the impression that Muslims come away with after listening to such groups is that they are being targeted for persecution by the State. This thinking and the re-enforcement of the belief that Muslims are being persecuted by the State, does the following. It re-enforces just the Muslim identity within those who accept this toxic message and it further alienates and marginalises them mentally to their surroundings and to those who are non-Muslim. This is not to take away from the state of emergency laws that were enacted in France after the massive terrorist attacks in Paris and which went on for two years, finally to be lifted in late 2017. There were real issues of infringements on civil liberties and life for some French Muslims is further complicated by abuse and racism. However, instead of raising the morale of French Muslims with hope, French Muslims are fed a diet of ‘raging Islamophobia’, a French State that does not care for them and a sense of being embattled that all plays into the hands of radicalisers. What women can and can’t wear is naturally a campaigning point for these groups, as is Islamophobia, something that we would term, anti-Muslim hate. Yet, the very defence of freedoms that these groups cite, they will not be willing to defend if, for example, a gay Muslim wanted to join them and speak about Islam openly. Or, if an Ahmadi Muslim wanted their open support, or if an ex-Muslim called for solidarity with them. Then these freedoms become a ‘pick and mix’ approach, something that shows how such groups discard democracy as soon as it does not suit them. France’s democratic values should not be at odds with Muslims. But with Islamists in the ascendance in Muslim communities in France, there is a risk that the very values that France defends, may become the ones that are attacked in the future. In recent years, several high-profile terrorist attacks, emanating both from the Far Right and from religious extremists, have brought public attention to the link between mental instability and susceptibility to radicalisation. Often it has been the friends, co-workers and relatives of those who have committed violent acts who have then retrospectively voiced concerns about those individuals’ mental health. Overall, links between mental health issues and extremist acts, whether motivated by a Far-Right or Islamist ideology, were first suggested by the family and friends of those who had committed violence. However, academics and researchers have also noted the link. Connections between mental health issues and extremism merit further investigation, not least because findings can then be implemented as part of a strategy based upon prevention and catching such individuals early, rather than judicially punishing them after they have committed criminal acts. As Chief Constable Simon Cole said: “We cannot arrest our way out of a terrorist crisis”. Instead, a more effective strategy is to understand the basis of such acts and utilise this knowledge to identify potential future extremists. It should therefore be a cause of reassurance that academics have noted the need for partnerships between mental health professionals and counter-terrorism police, with schemes now permitting police to utilise the expertise of mental health specialists and embed them within their work. Despite families of extremists complaining of a lack of support from health services, whether for themselves or for their troubled relatives, that the police are uniting with mental health specialists to utilise their research and expertise is promising, as we look to the future.